Iolanthe is the great elemental mage destined to take down the Bane... well, that's according to Prince Titus, who takes destiny very seriously. Iolanthe isn't as willing to sacrifice her life for a fate she isn't sure she can accomplish. But the Bane and his Inquisitor are looking for Iolanthe, too, and to save herself, she might just have to save the world. It's a little too bland. A capitalized, grandiose serif font, a dark sky background with a generic castle and an obscure motif... it almost looks like an adult fantasy rather than YA. I also don't feel it conveys the book's tone very well, but then again it's so generic that it couldn't really convey any tone in particular. 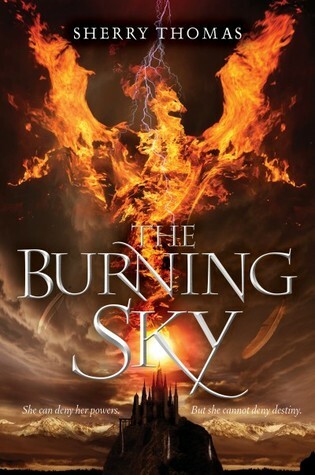 The Burning Sky is made of some of fantasy's best tried-and-true ingredients: from-the-ground-up magical world-building, a large-scale conflict between good and evil and a look into the idea of destiny and fate. Add in a straightforward, earnest romance, and you've got a book that can appeal to most everyone. The narrative was written from both Iolanthe's and Titus's perspectives, and it's difficult to decide which one I was more eager to read as the story progressed. Their journies and roles, though physically proximate, follow quite different paths; they're not exactly foils, but different in that Titus is initially very exterior-goal-oriented, and Iolanthe is more focused on her own wants and needs. As such, the dynamic between them helps propel the story as much as the actual plot itself and helps develop the two using backstory, banter and moments filled with humour and tenderness alike. The overall storyline crests, peaks and dips sufficiently to keep the pace tense. Occasionally, time passes in ungainly, unbalanced ways which leaves the reader unsure where in the story they are, a symptom of books that happen over long expanses of time. One definite highlight is how well-balanced the romance and the plot are — they build side-by-side, but one never overwhelms the other. It's worth mentioning, too, that the romantic dynaic between Iolanthe and Titus is far from conventional, which makes for all kinds of fun to read. This is probably a side effect of the copious amounts of worldbuilding in this novel: Thomas has created a parallel world to historical London with a history of magic that lends it credulence. With ample time spent both in London and the mage world, there's plenty of opportunity to reveal knowledge about magic to the reader. Concepts like vaulting, magic carpets and subtle vs. elemental magic are explored, and different locales are utilized well and filled with secondary characters. The theme of destiny is touched upon along with the concept of good versus evil; Iolanthe explores to some extent whether she should work with Titus just because he claims it is their fate. This exploration feels a bit stalled, however, as plot gradually takes over the story. Somehow, by the time the climax comes around, the decision to fight the Bane is a no-brainer to Iolanthe, which makes logical sense but feels a bit off. Nevertheless, the final battle is suitably epic, taking place in an almost meta-level piece of magic. Ethnic balance: 3 out of 5. Kashkari, a (swoonworthy) classmate at Eton, is Indian, and talks about England's colonization of India in a way that makes me hope it becomes a hot topic in the sequel (The Perilous Sea).